Despite being small at the time, a significant Jewish community lived and worked in Balatonfüred. The first Jew in Füred, as it was called, was registered in a tax census in 1730. Forty years later and as many as four families, a total of nineteen persons, were counted. Their settlement was hindered by the fact that they were granted permission to buy or build a house only as late as the Hungarian Reform Era. The law provided for their freedom of trade, crafts and establishment only from 1840. At the beginning they manage to have a livelihood at the bathing resort, selling acidulous spring water: they rented a tavern, and operated a butcher’s shop and a pálinka house – serving the bathers ensured their existence. Joseph Manes Österreicher, who received his medical diploma after the promulgation of the edict of toleration by Emperor Joseph II despite being an Israelite, worked as the first physician at the health resort with acidulous spring water for five years from 1786. He not only strived to develop and modernize the health resort, but also established a hospital for the poor in the village, and treated their children free of charge. Jews were the first to introduce pest-resistant grape varieties in their vinyards on their estates after the outbreak of phylloxera, thereby implementing modern production techniques. They played a leading role in setting up a network of wine agents as well as in wine trade. As a result of the joint work of old leaders of vinedressers in Füred and new wine-growers, high-standard viniculture appeared in Füred by the 20th century. It was not uncommon for local wines to win gold medals at national competitions, and the word of wines from Füred spread throughout Europe. The Jewish community was registered as an “autonomous orthodox Israelite community” in 1872 after the Austro-Hungarian Compromise of 1867. However, the first key date in its history is May 30, 1855 when the old church built on the foundations of the St Margaret’s Church from the Middle Ages was bought from Reformed Church members in the village of Füred. 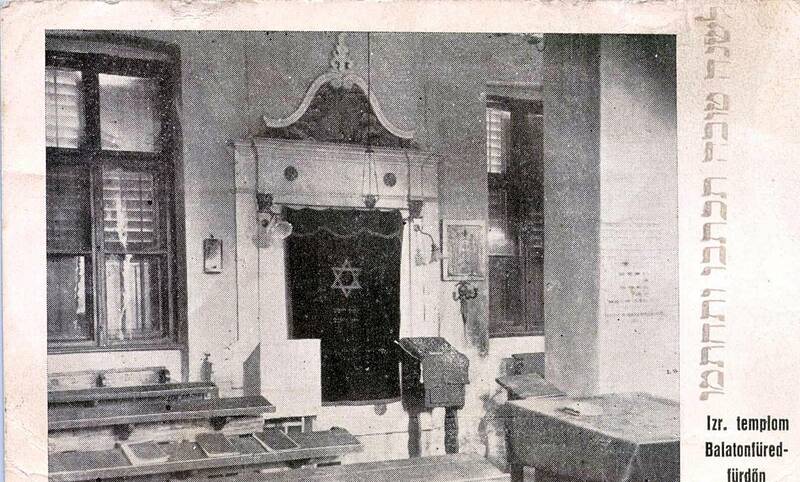 This building served as a synagogue for ninety years, until 1944. An Israelite central elementary school was operating in Balatonfüred for half a century; after its closure, Rabbi Ezra Goldstein continued teaching religion in a yeshiva (in Hebrew). In the First World War five Jewish soldiers from Füred died a hero’s death, and another five Jews earned distinctions that could have exempted them from the scope of provisions against Jewish people. Between the two world wars there were 150 Israelites in 42 families, out of which the men included 12 traders, 10 craftsmen, 4 farmers, 2 lawyers and 3 physicians by occupation, each of them being a respected citizen of the municipality. As a consequence of the second Anti-Jewish Law, new landowners took possession of goods produced in decades of work in 1942, vines were killed by laymen, wine cellars broke down, and once-lucrative businesses became unprofitable. 1944 saw an absolute tragedy: 156 members of the local Jewish community were deported, and transferred to death camps. Fifteen of them survived the Holocaust, but none of the children.